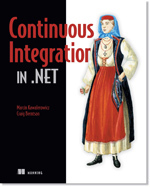 On 17 December 2013 I will be speaking at .NET Developers Group München. Of course in Munich, Germany. And of course in German. The topic is hardware programming with .NET. I will take Netduino, Tinkerforge and Raspberry Pi some LEDs, resistors, RFID sensors and tags (or even more) and show on live examples how funny it is develop software for real things. Juggling atoms is as much fun as juggling bits. I know that! I was invited speaker at this years Developer Week – .NET Developer Conference in Nuremberg, Germany. It was quite nice event and I was speaking about “Continuous Integration in .NET”. You can find Post-Event Report in this document (German only!). If you look carefully you will surely find my picture there! I’m happy to announce that I will be speaking about Continuous Integration in .NET at .NET Developer Conference (DCC) in Nuremberg, Germany. The .NET Developer Conference is a part of Developer Week (DWX) that combines 3 events WDC (Web Developer Conference), MDC (Mobile Developer Conference) and DDC. It takes place from 24th to 27th June 2013. My session is on Monday the 24th. More information on the DWX 2013, the program and speakers are available at www.developer-week.de. You are very welcome! PS. I have a discount code for all my blog readers – if you want one please drop me a line! MTS or Microsoft Technology Summit is the biggest technical conference Microsoft in Poland. It is the place where few thounsend developers, IT specialists and business people meet to get the latest informations from Microsoft and to talk about things that are relevant. This year was invited to MTS to give a talk about continuous integration. Let’s meet at MTS 2012!